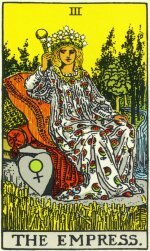 The Empress is The Earth Mother of the Tarot. She embodies all that is nurturing, clean and wholesome. Her powers resonate from her drive to create and care for life on a grand scale. The Empress is completely comfortable with her femininity and her sexuality. She is sensual, earthy, generous, and likes the good life. Still, her driving force is a need to create and nurture, and fulfilling this need overrides everything else. Scroll down to see all tips and articles!